Playtest is a weekly deep dive into game mechanics, concepts and experiences. Taking a running leap in Super Mario Bros. or determining the identity of the princess in Love Letter is a deeply satisfying experience. Smashing some candies together in Candy Crush Saga or completing construction of a wonder in 7 Wonders provides a sense of accomplishment. Figuring out a solution to a complex social problem in The Walking Dead or completing cooperative tasks in The Captain is Dead can generate a little extra faith in humanity. The goal of Playtest is to explore those kinds of moments and experience them together. 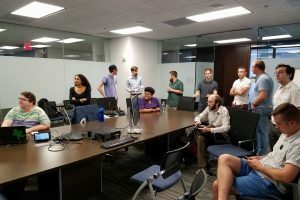 Playtest is a weekly hour-long platform hosted by the CMII for explaining in short talks the small parts of things we love about games and also giving people the ability to experience them by playing the games in a comfortable and critical setting. We are holding sessions in the CMII conference room on the 2nd floor of 25 Park Place from 3 – 4 p.m. on Wednesdays. For more information about Playtest, visit the main website or contact Cameron Kunzelman, ckunzelman1@gsu.edu.